Ever wanted to see the stars and realised that it's rarely the right time? HantsAstro.org has a very simple ethos. Get out and observe. Astronomy is not only done on cloudy, wet and rainy nights. Observing usually is done on your own, which is why most people join a group. Great, but there is one downside, you're all in one place! A lot of astronomers have their own telescopes and binoculars but would like to get out more. Hampshire is our Playground. 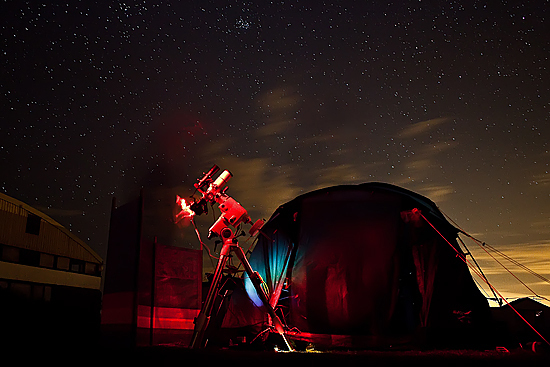 We have located several dark sky sites within easy reach so you can meet other people and get out there and observe. It's one of the best ways to learn. New to astronomy? Not sure if it's for you? Put off by that toy telescope your parents bought you when you were 12? Not sure what to buy now??? This is where you can start. Join in and find out more without any risk other than your time. All the information is here on this site, the eZine and on the forum. So when it rains, you can learn the other stuff. There is a lot of astronomy going on in Hampshire and this is your window to it. HantsAstro.org Hampshire is our Playground. Let's 'get out there'. We are very proud to announce that from September 2008, HantsAstro will be observing from Butser Ancient Farm, nr Chalton, Hampshire and in the grounds of the INTECH Science Centre & Planetarium at Winchester. Click on the links to find out more. Entry to the Observing Sessions at INTECH is Free of Charge starting Sept '08. Places are limited and are being signed up quickly, so why not Join In! All observing sessions are covered by our comprehensive insurance, and are only open exclusively to fully registered HantsAstro members who will be issued with passes. We now have our own collection of six telescopes, from a 70mm refractor through to a 10" Dobsonian, so you can experience the different advantages of different sizes and types of telescope that could help you develop your interest, or get some idea of what to buy and see how it performs. Or you can bring and use your own 'scope, either way practice makes perfect. If you have any questions regarding HantsAstro and it's not yet on this site then please feel free to e-mail me.